We took data from the Official Wimbledon website to compare some of the key statistics for the 32 seeded players in both the Gentlemen's and Ladies' tournaments. On the men's side, we can see where champion Andy Murray thrived. 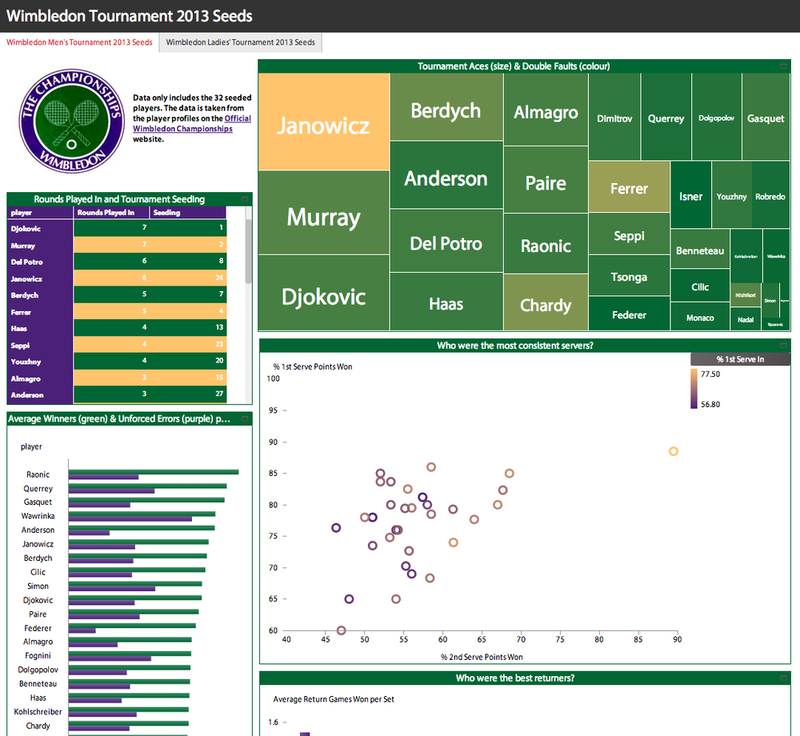 Looking at the BIME treemap, he is second only to Jerzy Janowicz in overall 'Aces' although the visualization shows Murray hit much less 'Double Faults' compared to the Pole. The column chart illustrates further where Murray got his edge over the competition - in the return game. Murray broke the serve of his opponents on average 1.5 times per set, the most out of any of the seeds in the tournament. On the ladies' side, Bartoli appears to have had a similar path to glory. She broke her opponent's serve on average 2.5 times per set, only bettered by Azarenka (although it has to be noted Azarenka was forced to retire injured and so only played one match). The bubble chart shows Makarova, Safarova and Williams to be the most consistent servers winning a high percentage of points on both 1st and 2nd serves. So what have we learnt... If you want to be a Wimbledon Champion then practice returning those serves! View the dashboard HERE or by clicking the screenshot below. BIME is an extremely flexible tool that can be used to analyze and visualize a wide range of data from both online and on-premise datasources. Try BIME for free today by clicking the link in the top right corner.